Urban Dictionary defines “hipster” as one who defies “conformity,” “cultural norms,” and “mainstream.” So consider the Fujifilm Instax Mini 8 an instant hipster accessory, seeing as how it still prints photo on film when everyone else has moved on to Instagram, Hipstamatic, and Camera+. It ain’t the original Spectra System, and it sure costs more than one, but the premium one pays to defy mainstream is worth the added cool factor. Take for example when I whipped out this baby in the hip West Village neighborhood of New York. Onlookers stopped to check out my photo-taking session. Friends huddle over to await the “instant” photo processing. Everyone wanted to know what this bulky toy camera was all about. So let’s dive in a little further. Available in an array of candy colors, our review unit came in basic black. 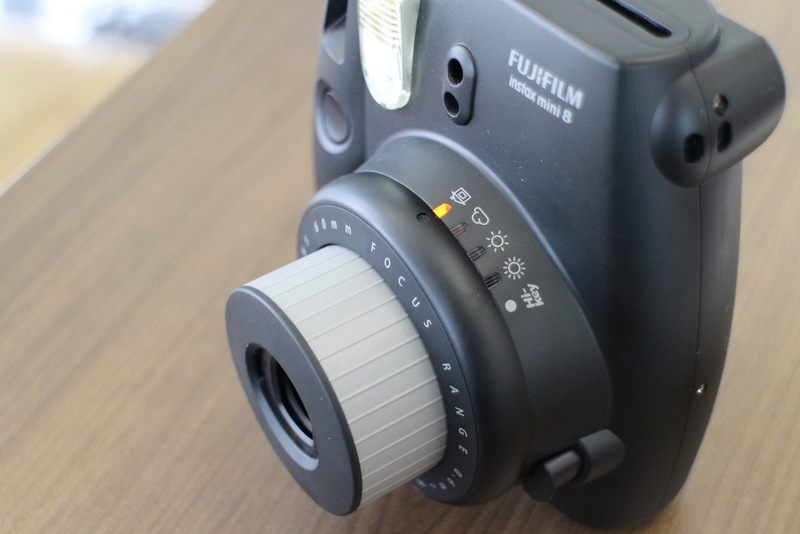 Unlike a traditional Polaroid camera, the one-pound Fujifilm Instax Mini 8 is held vertically. The matte plastic finish is good for keeping some finger grease off, adding a nice grip to when you’re peeking into the tiny viewfinder. On the side, you’ll find a slot to insert two AA batteries to activate flash. 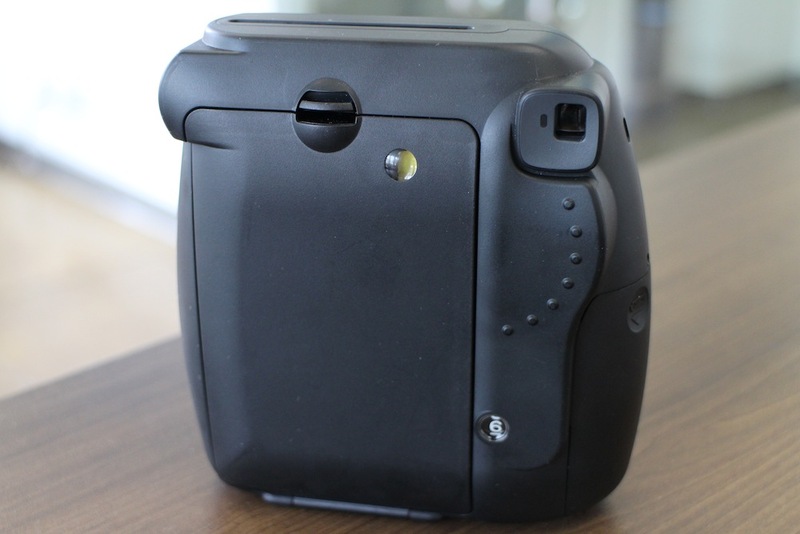 The back has a slot to load packs of Fujifilm specifically designed for the Instax Mini series. Below that slot is a counter for remaining shots. Each pack of film comes with 10 photos, so use them wisely because they’re pretty limited. Over at the front of the camera, there are a few exposure settings above the collapsible lens. Remember, this is as close as toy-meets-real-camera gets, so we’re happy with the options for cloudy, sunny, clear, indoors, and “Hi-key,” an option for extreme brightness or those who want an extra glow effect. Using the Instax Mini 8 is as easy as pushing the lens button, rotating to the desired exposure, waiting for the red light signifying flash is ready, and pushing the shutter. It takes roughly five seconds to power on; a successful photo should print out from the top of the camera and complete processing in approximately 10 seconds. However, figuring out the right exposure, even for a tiny toy camera, can be rather tricky. How do you differentiate from a fairly sunny to a not-too-sunny-but-still-a-bit-bright setting? This is supposed to be simple photography, not meteorology! 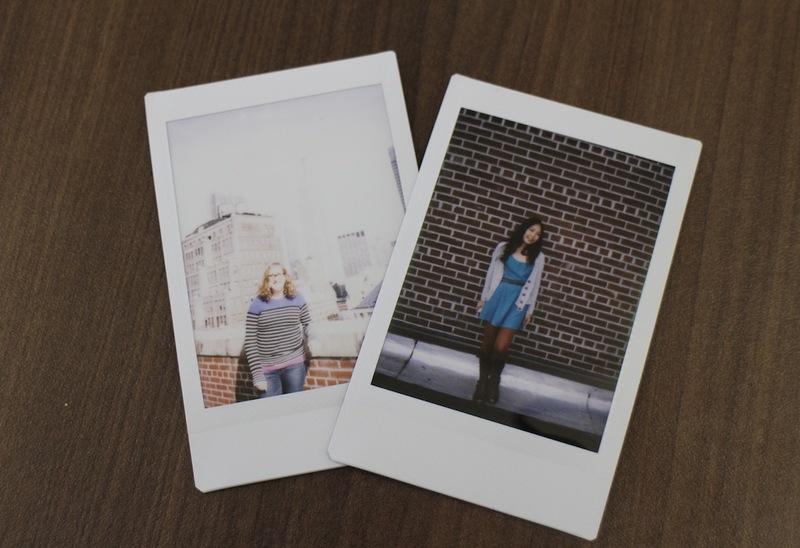 You also should not expect manual focus – or any kind of focus feature – on the Instax Mini 8. The device boasts a range of two to eight feet, but your main object should be no more than three feet in front of the camera for maximum quality. We learned these lessons the hard way, wasting precious film on several test shots. But once you’ve managed to master the setting, it’s all fun and games! We were overall impressed by the photo quality; under the right exposure, colors vividly pop and add dimension to what is otherwise just a flat printout. You can also write on the frame surrounding your photo, marking notes or dates of when the photo was taken. Although the camera body can be bulky, the Instax Mini 8 will be good to take with you on a date or short trip. Your friends will beg for a photoshoot, but you’ll just have to remind them that at about $15 for 20 film pictures, that’s 75 cents per flick. Per credit card-sized flicks, no less. They don’t call these Minis for nothing. If money’s no object to you, by all means, the Fujifilm Instax Mini 8 is a fun accessory sure to bring back nostalgia even from the youngest of photographers. Once you figure out the controls, you’ll be tempted to snap every artsy frame like you’re working for Instagram. Unlike the readiness and unlimited quality of mobile photography, paying the price for film may just force photographers to be more cautious of what to shoot and print. For once, it’d be a nice change to think about what moments to capture, making the physical value of each snap worth the momentous savors. It’s a thought process that we wish was more mainstream, but alas, we live in a digital society that entitles unlimitedness. So for now, we have the Instax. 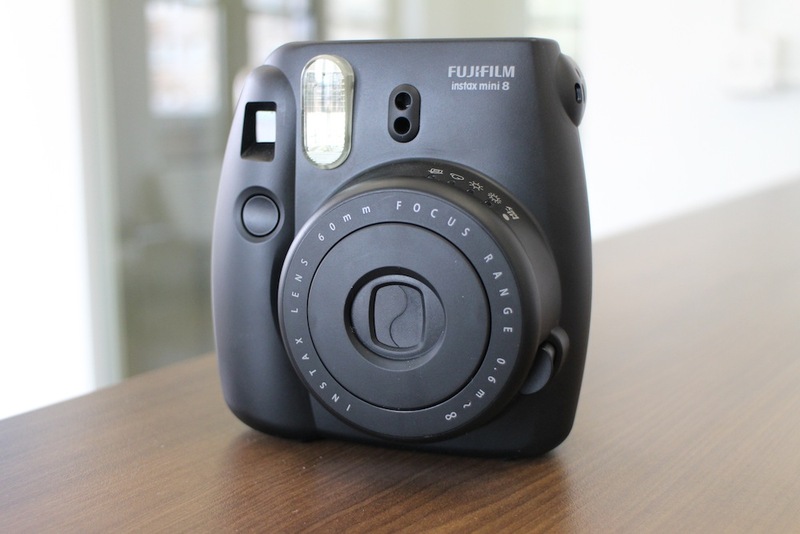 The Fujifilm Instax Mini 8 is available today in white, black, pink, blue, and yellow for $95 plus the cost of film. Ford's Euro-legal 1.0-liter EcoBoost racer is faster around the ‘Ring than a Ferrari Enzo?